It’s bed time for me, which usually means a final round of animal duties. The dog Frito has been in the house for several hours but is currently sleeping away. I decide that since my husband Brad is still up, I will take Frito out to go potty and then let him stay downstairs on his bed since Brad is going to be up for awhile. Frito hates the dog crate so I hate putting him in there and avoid it whenever possible. You see, Frito still has accidents sometimes and I am tired of cleaning the carpet on a daily basis. Besides, the carpet just cannot take much more abuse and so Frito typically goes into the crate at night. I take Frito outside and he does a great job doing his business. I am confident there will not be any accidents this night. I go to bed, leaving Frito laying on his bed in the living room and Brad laying on the couch next to him watching TV. A little while later, here comes Frito upstairs (where he is forbidden to go because this is cat country). His little face is looking up at me with love and his tail is going a mile a minute. Oh man what a cutie…I pat the bed and up comes Frito to the forbidden bed. He lays down next to me and places his head in my lap and goes to sleep. Oh man, Brad is going to kill me. I wait awhile for Brad to realize the dog is gone…nothing….maybe he is asleep down there and Frito can stay. Joey kitty is in his usual spot at the foot on the bed and doesn’t seem to mind the dog being there at all. Hmmm. Here comes Kenny kitty…he doesn’t see the dog at first then freezes mid-stride and gives me a look. I tell him it is OK so he takes his usual position across from me by the head of the bed. The dog watches this and then puts his head back down and goes to sleep. Here comes the final cat, my oldest, scardy-cat Claire. 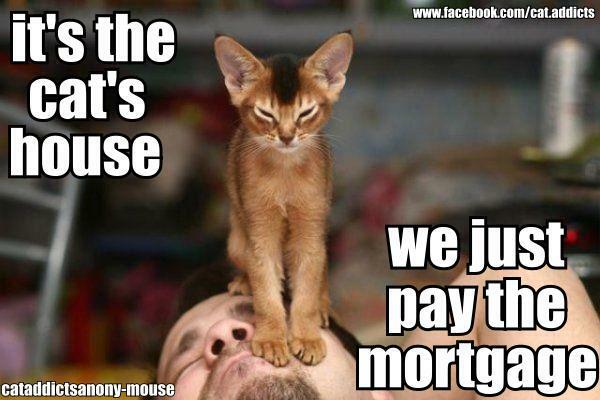 Claire is our nerve and brain damaged kitty. She jumps up, says hi to Kenny and rushes over to get her nightly petting from the human in the bed. Yikes! It’s that damn dog and he is blocking her from getting to her human! I see her thinking…I’ll just back up and rub on Kenny while I think about this (she is a slow thinker). Kenny will only take the rubbing from Claire for a few seconds. Claire decides she’ll go sit on the night-stand and glare at me, maybe I’ll fix this injustice. I don’t fix it and she goes back to her comfy bed on the floor fuming. You see, Claire will only let us pet her on the bed. It’s the one spot where she feels she can let down her guard a little and enjoy the wonderful experience of being petted. Claire kitty loves being petted more than any cat I have ever met. However, she is too afraid of humans to indulge herself anywhere but on the bed where she knows she is safe. The bed became the safe zone when Claire was deathly ill and couldn’t refuse to be held. During this time I would place her on the bed and coo to her while I petted her. That is how the bed-is-safe-for-Claire came into being. I resume my TV watching while waiting for the sleeping aids to kick in. I know, I shouldn’t watch TV right before sleep. Since I rarely actually “go to sleep”, I use the TV as a focus point while I drift off, wake up, drift off, wake up. It helps with my frustration. Anyway, you get the picture. Frito…FRITO, Brad calls out. I yell out to Brad that Frito is upstairs. Brad begins the trek up to the bedroom. Frito hears him coming, raises his head, wags his tail and puts on the cutest face possible. It works! Brad sees the usual two cats lounging on the bed (Claire always leaves after getting her petting) with me and the dog. Rather than being his usual grumpy self and ordering the dog off the bed and downstairs, he gently reminds Frito he is not allowed up here. Brad says he can stay if that is what I want. Wow, that went really well! Frito stayed with me on the bed all night as far as I know. He did move to Kenny’s spot at some point. I hope and pray I don’t find any stinky, wet spots on the carpet. I really want this to be one big happy family. It’s going to get crowded on that bed and I couldn’t be happier. Animal Outreach (AO) provides FREE feral cat spay and neuter services. AO provides low-cost spay and neuter services for dogs and cats. AO reduces the number of unwanted cats and dogs in El Dorado county by thousands and thousands every year! Last year, AO performed over 7,300 spay and neuter procedures. Wow! Each procedure requires an experienced vet and many support staff to handle the appointments, paperwork, surgery preparation, recovery and release as well as medications. This is an expensive procedure that AO provides either free or at a minimal cost. AO provides affordable, no appointment necessary, walk-in vaccination services. AO rescues dogs and cats from high-kill shelters in California and works with the local shelter to help with their over flow of dogs, cats, kittens and puppies. Providing a temporary home and medical care for homeless pets allows these animals the time and care they need to find their permanent homes. Thousands of animals are saved from death, every year, by the hard-working, caring folks at Animal Outreach of the Mother Lode. Animal Outreach is competing against 75 other SPCA’s, shelters and rescue groups across America for the top prize of The Golden Bone award. The Golden Bone award goes to the group that raises the most money in this Strut Your Mutt campaign that ends in September. You, our supporters, can show the entire country that we have the best supporters by doing well in this competition. This would be a fantastic award and would allow AO to strut our stuff all over TV and newspapers! This award will help raise awareness of the problem of homeless animals everywhere as well as the needs in our community. The most money raised by the participating groups, so far, is just over $6,000. The AO Strut Your Mutt Team goal is only $5,000. However, with your help, the team could easily meet or exceed that goal and capture the coveted Golden Bone award. There is another award up for grabs, The Golden Collar Award. This award is for the person who raises the most money overall. This would be another great achievement that you or one of our current team members could win. Like Animal Outreach of the Mother Lode animal rescue on Facebook. Our Facebook Page is http://www.facebook.com/AnimalOutreachRescue. Share AO posts and status updates on your Facebook page. Friend me personally on Facebook at http://www.facebook.com/bsudiane. Share some of my posts on your Facebook page to extend the reach of Animal Outreach’s efforts to save the lives of pets in California. 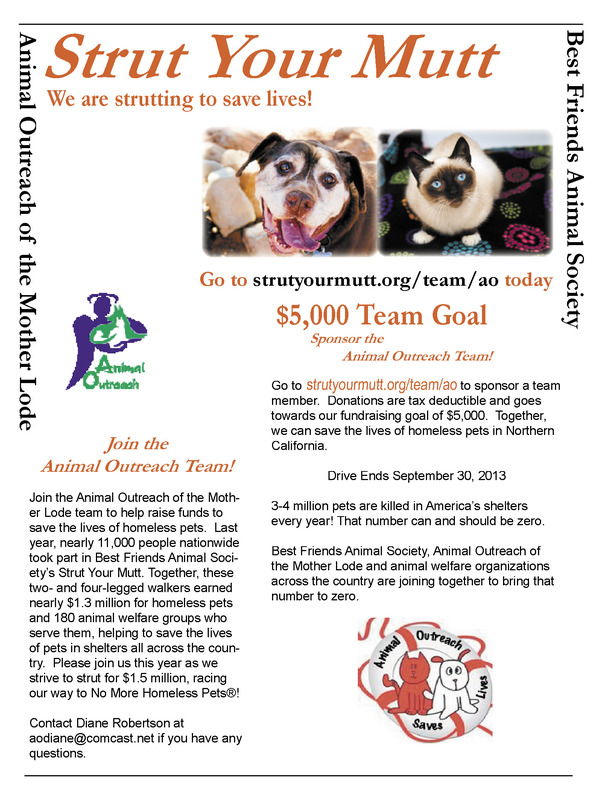 Print and share the Animal Outreach Strut Your Mutt poster at your work and/or other social places. It takes a lot of money, donations and volunteers to keep this organization and its programs running. Thank you on behalf of all the dogs, cats, kittens and puppies whose lives are touched and saved because of generous supporters like you!